The objective of this project was to build a collaborative traversal and distributive sensing rover units to magnetically map the field under the rovers. The rovers use Raspberry Pis for their path-finding algorithm , the D* lite (which is the same algorithm used for UCSC Autonomous Rover). The Raspberry Pi logs the coordinates and magnetic data in the SD card so they can be post processed. This platform may be used for landmine detection and because of their low profile and light weight, they would not detonate land mines while they are scanning the ground. It also can be used for paleomagnetic mapping for scientists and researchers. 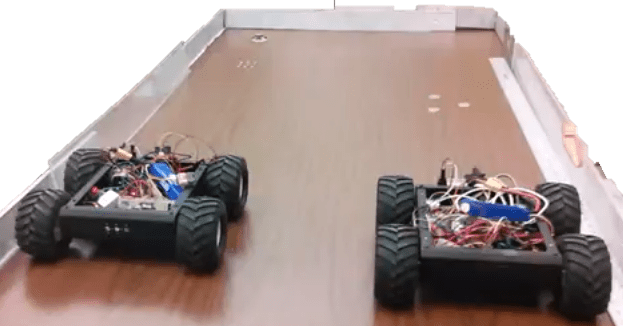 The rovers communicate using the Zigbee protocol and inform each other of the mapped field.. Each rover can scan the field using a sensor (Geiger counter, magnetometer, …), while the others are mapping the same field using other sensors. They are able to sense the field synergically to optimize the timing of their operation.